Childhood obesity is a topic that continues to gain interest, as experts, doctors and parents all look for ways to help children lose weight. For some parents, keeping their children fit is worth every effort. That is why a new trend in personal trainers for children has suddenly began popping up. Dyson Dunkle is 10 years old, a little over weight, and wants to become more active. So his parents hired a personal trainer to help him lose weight and get into shape. Children as young as 3 years-old are starting to work out with personal trainers, while their parents pay as much as $75 per hour in hopes of winning the war on childhood obesity. For young children, lifting weights and other strenuous activities are not considered healthy to do. But some personal trainers have manged to re-aim their standard adult routines into workouts that are suited for children. Jumping jacks, push ups, and fun activities can help children be more active and hopefully lose any extra weight they have. “Ultimately we want Dyson to be strong and happy with his body and his weight,” David Birnbaum, Dyson’s father. 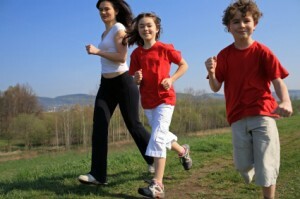 Is Lack of Exercise A Cause of Childhood Obesity? New Study Says No. A little extreme for a three year old, but a great idea for kids who are a bit older like 10.